Many of our out of town clients schedule a Virtual Vastu Consultation with Nitien Parmar, Chief Vastu Consultant, who has been in practice for over two decades. This allows you to discuss the vastu status of your proposed or existing premises. The Virtual Consultation is usually done either by email or phone, but in some instances, we can also arrange for a Skype chat. Nitien Parmar, a chief Vastu expert, has been doing Virtual Consultations for many years for clients from all over the world. Before your Virtual Consultation, you will need to send us information about the site, layout along with direction. Your details are then sent to Vastu Experts for the reading. We assured that your information is highly confidential. Investment in the property is a big decision. It is very illiquid. Choosing the right property which supports your future life goals is a must before you sign a paper on the dotted line. The new home should not become a challenge for you. We have done long distance consultations for many clients in India as well as around the world. No matter where is your location, the vastu consultation can be done remotely. We can help you to selected best property based on your map, plan and other details of the Pre-Purchase property. Are you suffering from poor health after moving into a new house? Is your job or career going downhill out of a sudden? Do you find difficulty to become financially independent no matter how much effort you put into it? Are you finding a relationship issue? 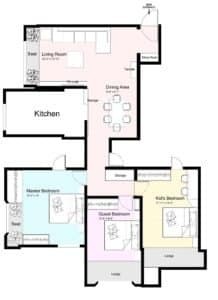 Simply vastu evaluation of your house plan will help you to find out a true reason and solution as well. Be it a new or an existing residence, good Vastu arrangement can create a harmonious environment for you and your family, allowing all to flourish in the areas of happiness, career, academic, health and also a relationship. The cost of the virtual consultation is $ 120 (Rupees 7500/-) and can be payable thru PayPal or online payment method. Please note that the Virtual Vastu Consultation fee is non-refundable. After your details and plans are received, our team will evaluate your plan and may ask for more information required for Virtual Consultation. During the consultation, you can also speak to Vastu Expert Nitien Parmar as he analyses plan & recommends Vastu suggestions as well as Vastu remedies. Together you can discuss or mail your queries, questions, and, also concerns. 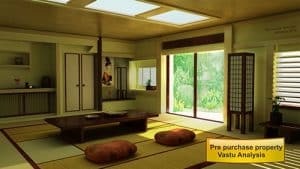 You will receive a brief analysis Vastu report about the plan via email.